The all-male vocal ensemble Cinquecento have won great praise for their recordings of Renaissance rarities. Their tone, vocal flexibility, collective and individual musicianship and commitment to their chosen repertoire places them at the very forefront of modern-day specialists in this music. Their latest disc features the music of Adrian Willaert, a contemporary of Josquin and for many years chapel master of the Venetian basilica di San Marco. Two extraordinary early works, Missa Mente tota and Quid non ebrietas, testify to the composer’s remarkable talent and love for complex contrapuntal constructions. Also included are four beautiful motets. 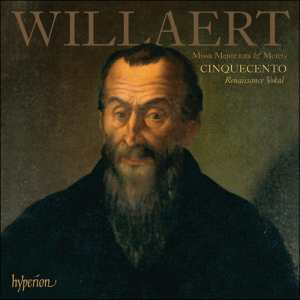 The disc is completed by one of the many compositional tributes rained upon Willaert at his death: Cipriano de Rore’s Concordes adhibete animos, a suprisingly joyful posthumous panygeric containing an ostinato on the words ‘Live on Adrian, glory of the Muses’. All works except for Josquin’s Mente tota and Willaert’s Laus tibi, sacra rubens and Verbum bonum et suave are premiere recordings.